As you probably know Italians have a long tradition of eating vegan food. You didn’t know it? Well, think about it: spaghetti with aglio, olio and peperoncino is vegan. Minestrone is also vegan. Eating fruit at the end of a meal instead of a dessert is the norm here. And, in addition we have a variety of dairy and egg-free sweets made with olive oil and wine or with fruits and nuts, like panforte or rocciata. And of course, over the centuries beans have been the only source of protein for peasant Italians. Until the 1950s most Italians only consumed 40 g (a little over one once) of meat per day. Meat was a rare luxury then and not the controversial evil it has become. 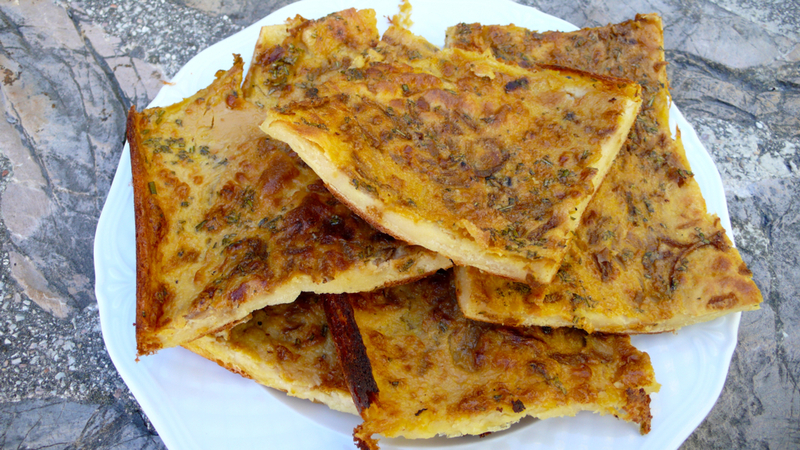 The farinata, also named fainà or cecina, is a gluten-free chickpea pancake similar to French Socca and Moroccan Kalinté. Typical of the Ligurian and Tuscan coast, it’s baked in a copper pan inside a wood fire oven and sold on the streets as a substantial snack. In Livorno, it is served in a sandwich, layered with grilled eggplants and pesto but fancier versions exist, for example slathered with soft cheese or even truffle butter or, very un-veganly, rolled around a slice or 2 of prosciutto. The recipe is incredibly simple because it is based on a ratio of water to chickpea flour of 3 to 1 by weight, which yields a very thin and watery batter. Just mix the flour, salt and water until smooth in a bowl, then cover. You do soak beans before cooking them, right? The farinata works on a similar principle, so to make it digestible, it’s very important to let the batter rest for several hours or, even better, overnight. Should a foam form on the surface, remove it with a spoon and discard it. When you’re ready to bake the farinata, preheat the oven to maximum temperature to get as close as possible to wood-burning oven temperatures. Meanwhile, place a small pan on low heat and sautè the onion, covered, in one tablespoon olive oil until golden and caramelized, about 10 minutes. With the oven fully preheated, take a large pizza pan and line it with parchment paper. The farinata is famously sticky, so don’t omit the paper! Because the batter is so liquid, it is easier to put the pan in the oven and then fill it with the batter and condiments. At the beginning it’s like baking a broth, it looks quite worrisome but it does work in the end! Pour a generous amount of olive oil in the pan so the paper is covered by a thin film of oil. Brush also the sides of the pan with oil. Place the pan in the oven leaving the door open and the rack half-way out. Stir the batter and pour it into the pan. It should be no more than 1 cm (1/2 inch) deep. If your pan is not large enough, bake it in 2 or more batches rather than making it too thick. Scatter the onion and rosemary leaves in the batter, then carefully slide the rack inside the oven and close the oven door. Bake 15 to 30 minutes, or until the pancake is firm and the edges are golden. The variable cooking time is due to the thickness of the pancake. The farinata should be moist like a thick custard inside and crispy outside. Serve hot, with freshly ground pepper and a sprinkle of grated Parmesan if using. It’s not orthodox, but I like to dab it with a spicy sauce like harissa or salsa or green tabasco, whatever I have in the house. Don’t tell the Ligurians though! If you have leftovers, cover and refrigerate. Heat slowly in a non stick pan with only a few drops of olive oil until fragrant and crispy again. This dish would be a great appetizer or a healthy snack for the upcoming holidays. If you can’t find the chickpea flour or need more healthy snacking ideas check out this page at nuts.com. I love farinata by all its names in different regions – both in Italy and France. I can’t wait to try this, as I have some really nice chickpea flour in the fridge! I hope it was a success David! I bet these smell & taste amazing! I have toyed with the idea of making a farinata di ceci for years. Thanks for the reminder, ‘ll follow your recipe. thank you! I have tried a few recipes and I find the plain farinata a little too “beany” for my taste. This version is my favorite, especially with that sprinkle of parmesan ! yes Frank, it has a chalky-like aftertaste if not soaked enough!